There is no fitness without proper nutrition. What we eat either optimizes or hampers our performance and it is, therefore, essential to take a look at what foods help to maximize our physical capabilities. According to Greg Glassman, the founder of Crossfit, we should eat meat, vegetables, nuts, seeds, fruit, a little starch and no sugar. CrossFit athletes across the world have sought ways to construct diet plans, some more religiously than others. 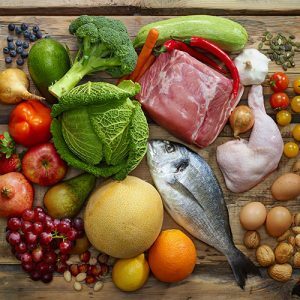 Some have chosen the “paleo diet”, others the “zone diet”, some have opted for the “primal diet” and lastly, some have chosen a medley of these three. The paleo diet, as the name suggests, reverts back to the diet of our forbearers, to an age before intensive farming. Some call it the caveman diet and that’s a pretty simple way to understand this diet. Imagine a caveman or cavewoman: what did they eat? You can be pretty sure that their diet included quite a lot of meat, no dairy produce, no bread products, but lots of wild berries, fruit, nuts and seeds. Doesn’t that sound just like the diet Greg Glassman advocates? Precisely! The zone diet is constructed around the control of three major hormones: insulin, the storage hormone; glucagon, the sugar release regulator; eicosanoids, the master hormones. Our physical performance can be optimized by controlling these hormones with the foods we consume. The diet itself calls for a three-zone dinner plate division: fruit, vegetables and low-fat protein. Advocates stress that this is not a zero-carbohydrate diet, however, it is advised to opt for low gi carbohydrates such as fruit and vegetables and a select few grains. This diet is pretty similar to the paleo diet with the addition of some dairy products such as Greek yoghurt, butter and some cheese. While attempting to stay within the boundaries of these three diets, most CrossFit athletes will either get the advice of their instructor or construct their own diet. Just how closely each individual sticks to these principles is really a matter of personal choice. Even though the three above diets have been proven to optimize athletic performance, not everyone may wish to go about their food intake in quite such an scientific way. Furthermore, some CrossFit athletes occasionally “break out” while others don’t. 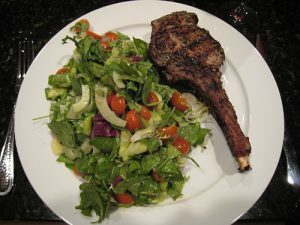 By adopting a simple, common sense approach, you can go a long way toward eating a healthy, performance enhancing diet. Stay away from processed foods, consume lots of fresh fruit and vegetables and a decent amount of lean meat, and you will achieve quite a lot. Cutting down on bread products and sharply reducing your sugar intake will also help, as will the inclusion of nuts and seeds. Ultimately, it is up to each individual to eat a healthy diet and each and every one of us has to determine their own diet. It doesn’t take a rocket scientist to work out that you shouldn’t eat a big pizza before working out, nor a nutritionist to tell you that eating lots of fresh fruit and vegetables is good for you. As soon as you become a conscious consumer of food and monitor the quality of the foods you eat, your diet will improve. Once you eat fresh and healthy food and ensure that your get sufficient protein, fibre, fat and nutrients your performance will automatically improve without you having to put too much thought into it or construct complicated diet plans. Of course, as so many others, you may wish to do so, simply because it makes you feel good and provides you with a solid structure. Whatever option you choose, just remember that good nutrition is the foundation of high performance.